It has been hard to get up for going outside recently, with persistent cold drizzle making a mess of matters. Perfect timing though, yesterday over the holiday, the clouds parted, and we got an afternoon of 50 degree and sunny weather. It was a long overdue opportunity to go see what’s happening in the garden. Not a whole lot, but there are a few things that look okay. 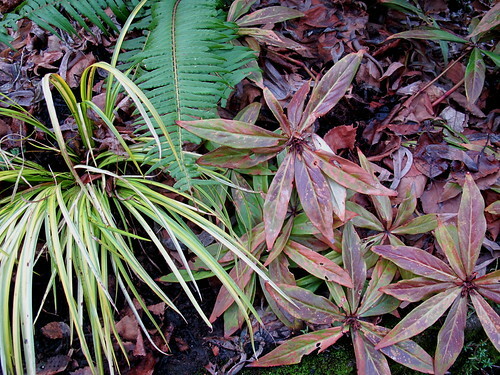 I really like this Lysimachia pardiformus stenophylla – with evergreen star shaped leaves that blush in winter – next to a Sweet flag (Acorus gramineus ‘Ogon’). 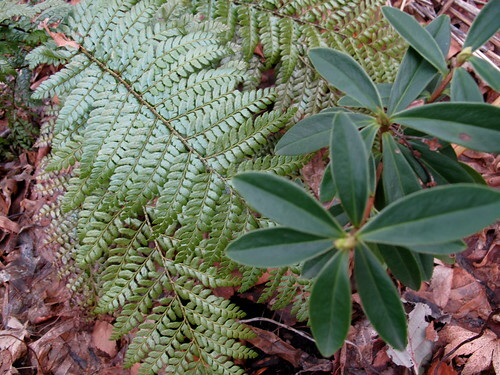 They’re both still growing in, but the fern Polystichum dycei next to Daphne tangutica are holding up nicely, none of that ratty tattered look that a lot of my evergreen plants are sporting these days. If I knew my cyclamens were going to hold up so well, I would have bothered to write down the name. It’s an imperfect system I have going here. 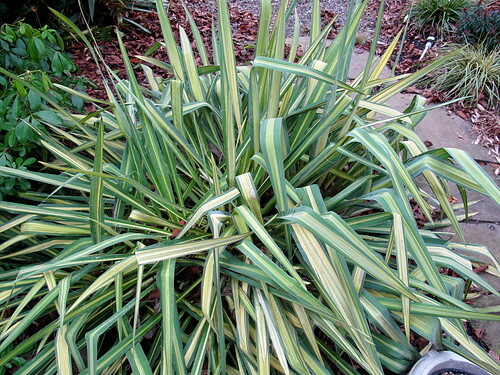 It seems the yuccas look fantastic all winter, but they usually go through an ugly duckling stage in spring where I’m sure I’ve lost them. To the left, barely visible here, Choisya ternata (mexican orange) is also a reliable stand up plant all year. Now that I’m back inside in the dark, I see that I have some carex and euphorbia across the path that look pretty good. 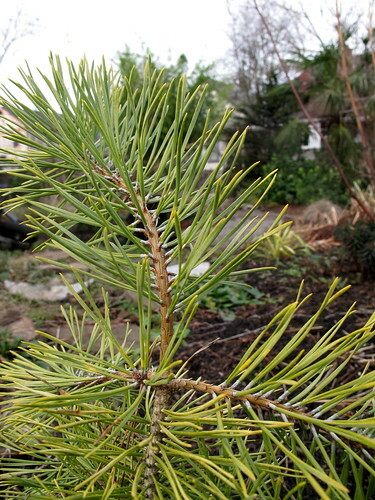 The golden pine I never talk about, that always takes a back seat to the showoff Chief Joseph, but this is Pinus sylvestris ‘Gold Coin.’ It’s not as bright gold as it was when I got it last February, maybe it’ll get a little stronger color when the new growth arrives. It’s a shrimp now, but it should be a good landscape addition when it’s 8′ tall in 10 years. I would say 10 years seems like a long ways off, but the last 10 years have flown by, so I guess it stands to reason the next 10 will too. I have always been impatient for the return of the deciduous leaves in spring. 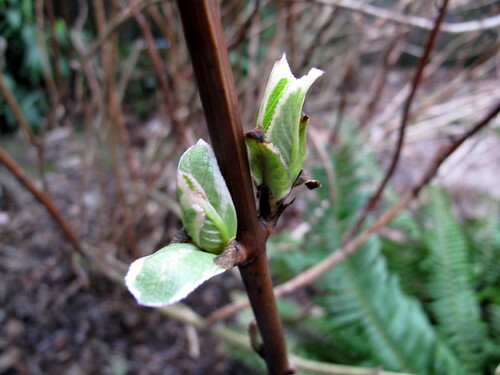 Last year I didn’t have leaves emerging on the variegated lacecap hydrangea until February 4. I’m a couple weeks ahead of schedule this year. Maybe it’s an indicator of an early spring? Oh I hope so. And I’ve officially called time of death on my Agave americana. 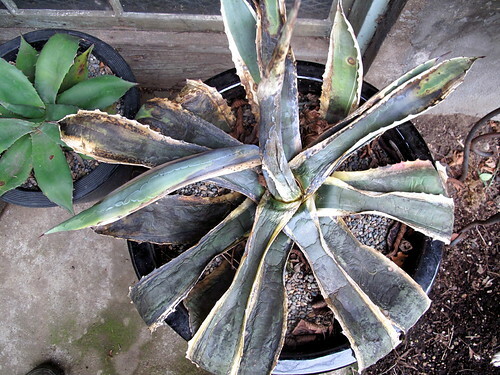 For those keeping track of overwintering agaves – it is apparently not sufficient to place this one next to a south facing wall by the window where the furnace lives. The 13 degree low temperatures that one week did it in. Fortunately I had saved some of its pups indoors, so I’ll be growing it again, and I promise to do better overwintering next year. Sad agave shot Megan! But the green guy on the left looks healthy! I’m going to have to get out and check my Hydrangea for buds, I don’t think I’ve got any yet but if so I guess I need to try and figure out how I’m going to prune the monster back and cut off last years flowers. Every thing else looks so good! 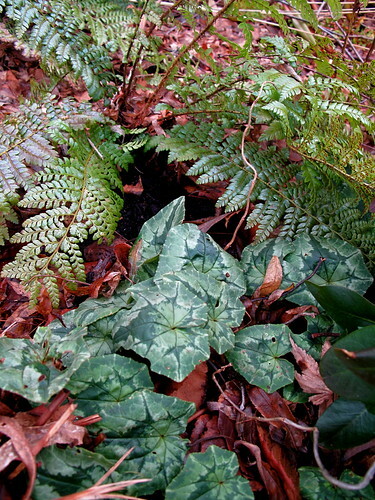 And those Cyclamen leaves are just to die for! I love cyclamen! Nice little performers.